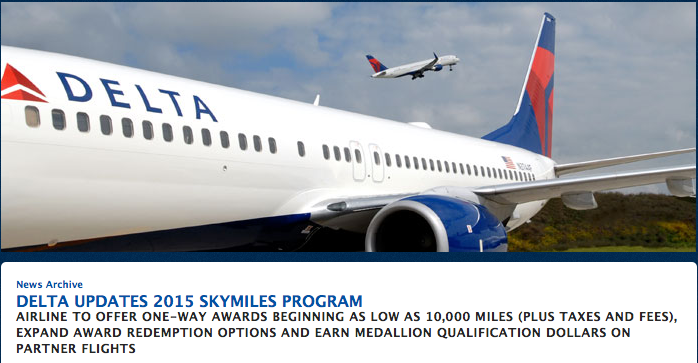 Delta SkyMiles announced more updates to their program yesterday. They are all good for once! However for us Canadians there is really only one of the three updates that really matters unless you are redeeming for short haul reward travel within the U.S. or from the U.S. to select Mexican and Caribbena markets. That is point number one below, short haul flights from Canada like Vancouver and Calgary to Seattle or Toronto and Montreal to New York are not included so it is really only for the flights we mention above. Point #2 is the main one that affects us, they claim better availability on award redemption via delta.com. A nice update if it holds true. The last point doesn't affect us as Canadian's do not have to have MQDs to qualify for Delta Medallion status. New One-Way Award tickets beginning as low as 10,000 miles plus taxes and fees, available through Dec. 31, 2015 for travel in select U.S., Mexican and Caribbean markets. Customers can now fly to several popular Award destinations with a 21-day minimum advance purchase. Improved Award redemption by expanding the number of airline partners that SkyMiles members can select to redeem for Award Travel on delta.com. Delta recently updated the Fly Delta app to give customers the ability to book Award travel from mobile devices. Since January, Delta has offered customers the ability to book SkyMiles Award travel through the Fly Delta app. Customers can now earn MQDs, regardless of ticketing carrier, for travel on most of Delta's airline partners, which will help them achieve Medallion status faster. SkyMiles members will receive retroactive credit of MQDs on eligible partner flights dating back to the beginning of the qualification year, Jan. 1, 2015. MQD earning varies based on carrier and percentage of distance flown as determined by Delta and fare class paid. In the bonus offers section there are a couple new increased sign up bonuses for credit cards. Both the BMO AIR MILES MasterCard and the TD Aeroplan Visa Business Card have had their bonuses upped.